8BitDo is a brand that has been synonymous with high-quality retro inspired controllers. With many different controllers and accessories available I always wanted to try some out. When pre-orders began in late 2017 on a new 8BitDo Bluetooth controller that would be compatible with the Nintendo Switch, PC, Phones, and the various Bluetooth adapters from 8BitDo themselves I was immediately excited! Best yet the controller would be styled after a traditional SNES style gamepad but with added thumbsticks and an extra set of shoulder buttons (SF30 for Super Famicom or SN30 For North American SNES). I finally picked up my 8BitDo SF30 Pro Bluetooth Gamepad last May and it has been one of my main PC and Switch controllers since. The box the SF30 Pro comes in is all business with a flat grey box reminiscent of IBM software from back in the day. Taking center stage is the controller in the same matte finish as the rest of the box. The controller being placed in a darker grey background is also very aesthetically pleasing to me and a nice touch. Also included in this darker background are a few bullet points about the controller's features and the Bluetooth logo. Below the controller, we see the name SF30 Pro Bluetooth Gamepad along with a variety of supported platforms. The 8BitDo logo sits beside the platform listings but uses a grey font so it doesn’t really stand out against the background. The top and bottom of the box include a top and bottom view of the controller respectively and give an awesome look its design. Nothing is printed on the sides of the box due to its slipcase nature. On the back, there is another dark grey spot to stand out against the lighter grey which includes further information about system compatibility for the SF30 Pro and a content list for what comes with your purchase. The last items of note include a better representation of the 8BitDo logo, the Bluetooth logo and Support information for controller updates. Sliding off the slipcase reveals the controller behind a clear plastic barrier. The shiny face buttons of the controller are also cover with another plastic film to prevent any unnecessary scratching during transport. Besides the controller the box also houses a users manual, to explain all the different modes the SF30 Pro can use, and a USB-C cable. Being modeled after the SNES controller the SF30 Pro has an incredibly small footprint. Seriously, it is only a hair wider than a standard SNES pad! The button layout has been slightly modified from that of an original to accommodate the inclusion of the 2 new thumbsticks but you might not even notice without a direct comparison. The new thumbsticks are even the same size as those found on an Xbox One or PS4 controller! Aside from the thumbsticks, new Home and Capture buttons have also been added to the front of the controller. The + and - labeling has also been added to the traditional Start and Select buttons. Where the Super Nintendo logo once stood has also been replaced with an aesthetically identical 8BitDo branding. The bottom of the controller now includes a new LED light strip to indicate player number when being used. The new shoulder buttons along the top of the controller are very interesting to look at. 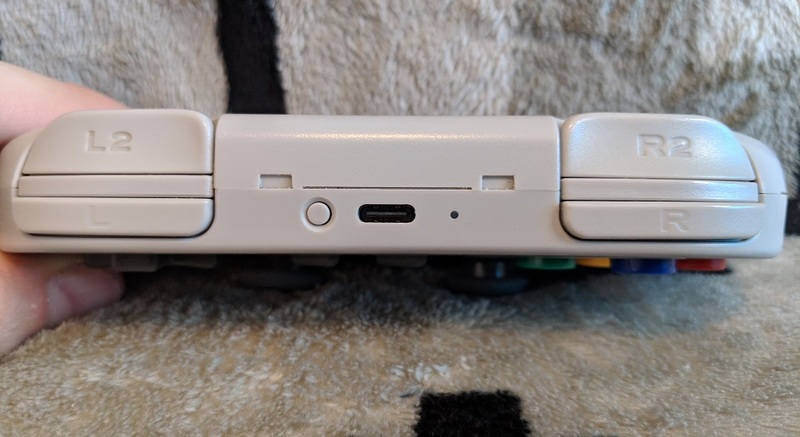 Both buttons are very long to further mimic a SNES’s shoulder buttons but the standard R and L are far thinner. A spacer roughly the size of L and R themselves also separate them from the new L2 and R2 buttons. L2 and R2 are over double the size of Land R and are built like triggers. They are obviously much longer than any triggers found on modern controllers but the function remains. With the SF30 Pro being aimed as a Nintendo Switch Pro Controller replacement I do have to wonder why 8BitDo opted to not use the Nintendo naming scheme of ZL and ZR here when the inclusion of + and - was already made clear on the front. Between the shoulder buttons, we can also find the USB-C port for use when charging, updating or using the controller in wired mode. There is also a sync button and LED charging indicator taking up resident on either side of the port. On the back, we get our last interesting thing of note on the controller itself and that is a label that shows us all the button combos needed to activate all the various controller modes. And, for those of you wondering, the Start button is what acts as the Power button in this listing. As far as build quality is concerned the SF30 Pro is pretty sturdy. I could feel no give in the plastic shell as I would press down on it in many areas. Thumbsticks still quickly snap back to their home position without any signs of wear even after nearly a year of constant use. The controller has also been able to withstand a moderate amount of abuse without a hitch! One thing that some of you may not like is that if you shake the controller you can audibly hear the D-Pad and face buttons wiggle in the shell. I really don’t think much of it personally because even 1st-party SNES controllers sound exactly the same. The SF30 Pro has been one of my favorite controllers to use on both PC and Switch since I got it. I have put in numerous hours of use in a wide variety of games. Classic titles in the Switch’s NES library played great with responsive inputs from both D-Pad and face buttons. Even playing modern titles like Breath of the Wild handled exactly as you'd expect on an official Nintendo Switch Pro Controller. Motion controls are fully implemented as we saw on the box earlier so there is no need to swap between controllers during play like on some 3rd-party options. Inputs were also once again responsive enough to use the games deflection system to great effect. Playing shooters on the SF30 Pro does take some getting used to with its oddly shaped triggers but once you figure them out it isn’t a bad experience. Thumbsticks provide the right amount of force to move for my tastes and the in-game performance was also very solid! I never felt like aiming was out of my control and there were no issues with any weird look acceleration settings. I have had plenty of issues with controller thumbsticks in the past so I am pleased the ones on the SF30 have handled so well. Now I will say that due to the controller's lack of grips this will never likely be my primary controller for a fast paced shooter but it does work well for them. Overall I found the most use out of the SF30 Pro when it came to my emulation setup. Due to the design of the controller, it made a decent all in one solution regardless of what platform was being played. Well except for the lack of 6 face buttons for Genesis and Saturn games but the extra shoulder buttons do make up for that. In fact every tutorial on my channel to date has been made using the SF30 Pro as the main input method! The button layout is also that of proper Nintendo controllers so telling my little ones to hit A was actually accurate for the game being played. I am also a huge fan that it can run on almost anything with compatibility for Switch, PC, Phones, Raspberry Pi’s, PS3 in Direct Input mode, and even Xbox One in Xinput mode through the use of the Windows 10 Xbox App. The controller also works with every 8BitDo Retro Receiver meaning that the controller can also be used on the NES, SNES, Genesis, PS1 Classic and NES/SNES Classics. The controller should also work easily for any MAC users out there but I can’t test how easy it might be to use on the platform. There may also be concern about the latency of a Bluetooth controller when being used with original systems but I have never noticed a difference personally in my games. I can easily beat Mega Man X with the SF30 Pro on a real SNES the same as if It were a wired controller. Unless you are the most die-hard of speedrunners you might not notice a difference either. Battery life has also been great considering how small the controller is. 8BitDo advertises the battery life at roughly 16 hours and that is about what I get if not more on most occasions. When in use on my PC I use the supplied USB cable to both charge and play. Not everything is perfect when it comes to the SF30 Pro however. There would be times during a game where the D-Pad decides to register a wrong input resulting in a few untimely deaths. I also found the D-Pad to be a little off for some precision combos in fighting games. For all the other games I play through though, the SF30 Pro’s performance exceeded expectations! I also wish that the proper namings for ZL and ZR had also been included to match the rest of the controllers Switch themed buttons. The SF30 Pro has been an awesome addition to my controller lineup and I am exceptionally happy that I did decide to grab one. Due to its near universal design, I often find myself using it over the right controller that goes with the system I am playing. There are things I won’t play on the SF30 Pro like shooters and fighting games but for everything else, it has been an absolute champion. There are the occasional misreads on the D-Pad but they aren’t often enough to be a deal breaker. The price is also much more manageable than that of a Switch Pro Controller making it a very attractive alternative. Especially since it has all of the same functionality outside of Amiibo support If you are in the market for a good controller to handle a multitude of different platforms The SF30 Pro is ready to be the workhorse of your controller fleet. Go grab one!